At the time, the tide was out. 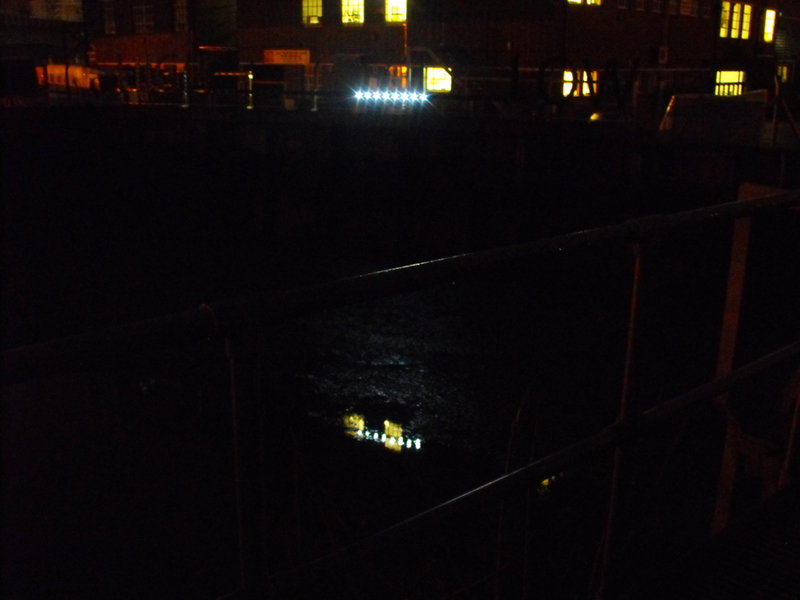 But you'd probably not want to be walking across the bridge at this time since it is mostly in darkness except for lampost light a few metres away each side of the crossing. It is also only visible to those on the DLR or mainline trains and those crossing the bridge, and perhaps from the top floor of Laban or from a penthouse in one of the new developments. It is strangely pointless since from these vantage points just by looking at the water you can see whether the tide is high or low. By looking at the direction of the water flow you can also tell whether the tide is coming in or going out. That would tell you whether a partly lit HI might become a fully lit HIGH. 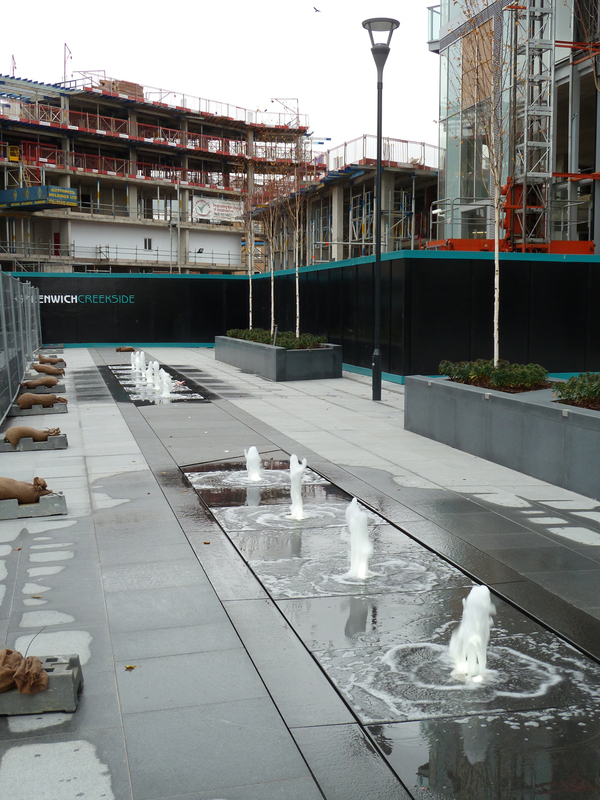 Meanwhile, down at the Creekside Village, the new tower is going up apace, and now we have fountains with lights...I went back to look in the evening but they were turned off...or perhaps this is also tidal driven and only works when the tide is in...? 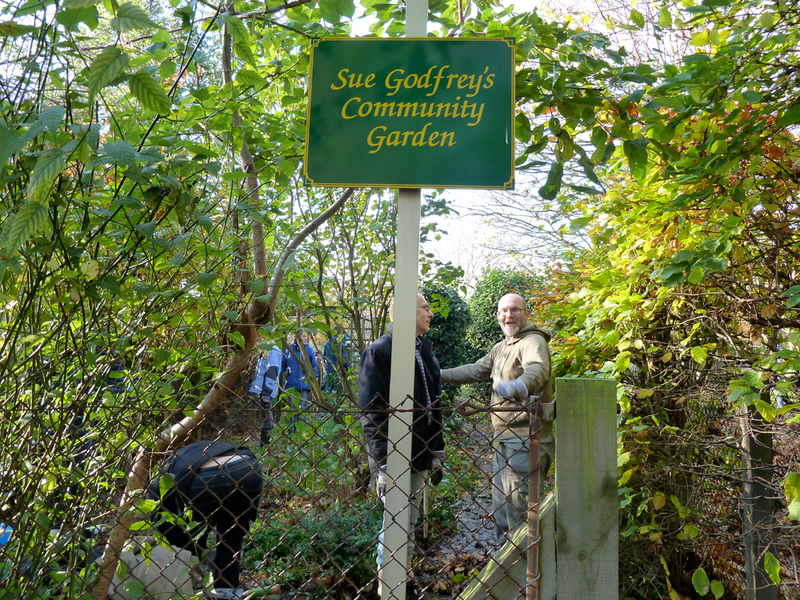 Volunteers from the offices of DEFRA (Department for Environment, Food and Rural Affairs) turned up this morning to help clear the Sue Godfrey Community Garden (besides the basketball court) and prepare it for replanting. The garden has been neglected for a while (since no one was sure who was supposed to be maintaining it) and had got rather overgrown. 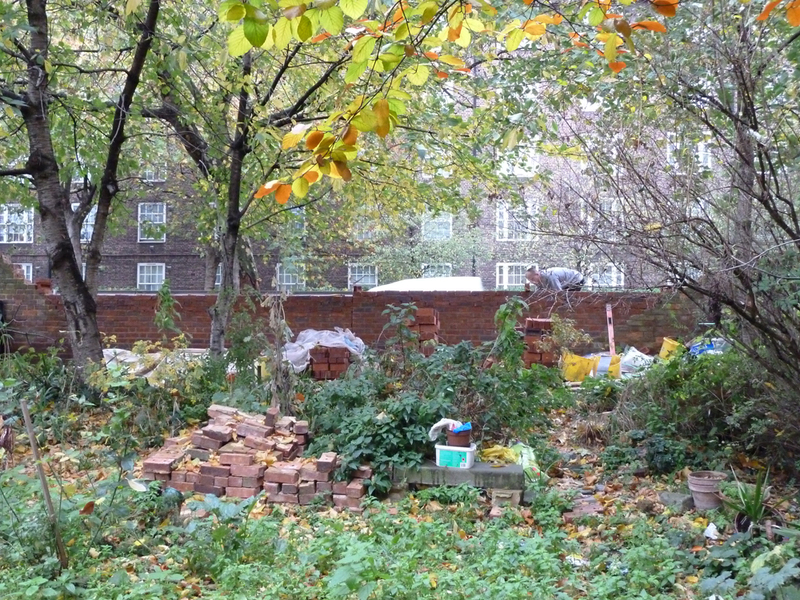 The Defra volunteers came at the invitation of Claire Pritchard of the Greenwich Co-operative Development Agency who hopes to set up a food growing garden on the site. 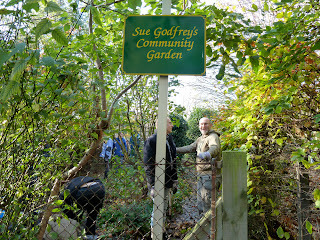 The project has come about through the co-op's involvement with the Crossfields Green Spaces group – Crossfields gardeners Ruth and John also helped with the clear up. 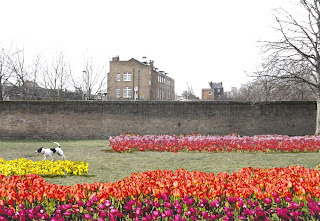 Meanwhile, Glendales have given Lewisham Homes 1000 bulbs to plant in the grass area on the other side of Church Street opposite the Sue Godfrey Garden. 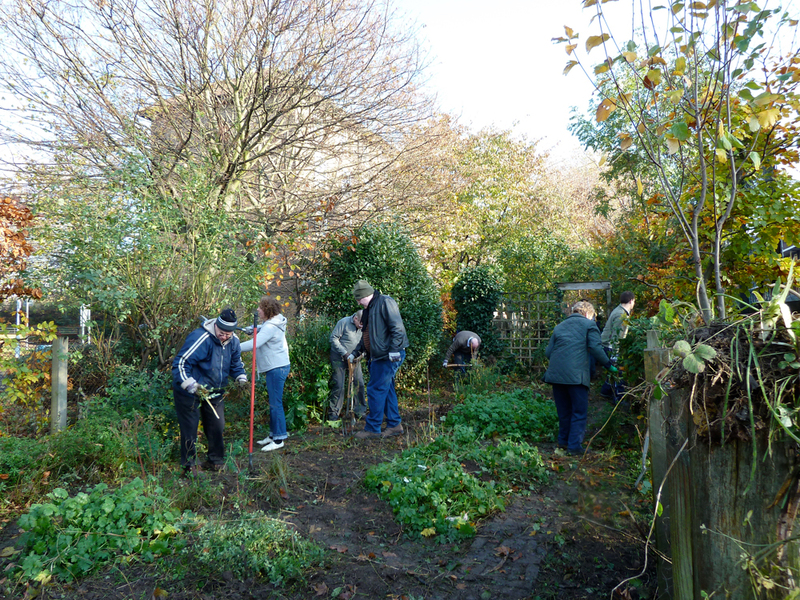 A Bulb Planting Day will take place on Saturday 27th November – volunteers are needed to come and help with this. On the day, WMM Architects will also be presenting and consulting on their plans for 'Creekside Urban Park', a by-product of their work on the Route One Cycle Path which at one time was threatening to demolish one of our gardens. The idea is that you come along and plant a bulb, have a cup of soup and then comment on the plans – which at present involve widening the footpath alongside the railway, removing some trees and planting some smaller ones. (More details when we have them...and watch out for a leaflet or letter through your door). 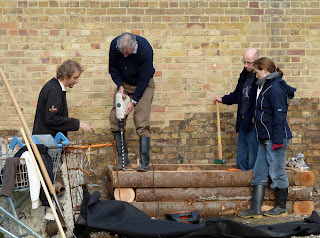 Meanwhile the volunteers were also working under the Greenwich Development Co-op's direction over at Creekside Centre, building some 'raised beds' that are intended for use by the Crossfields Green Spaces group, as part of a longer term plan to engage the centre with the community. Strange comings and goings on the Deptwich-Greenford borders. 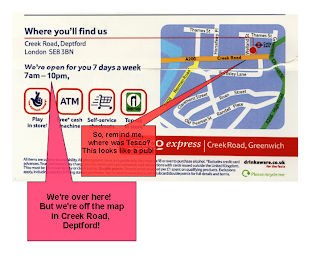 What is it about maps? Someone at Lewisham council appears to have thought that it would be useful to include a map with the consultations details that were delivered to residents earlier this week. 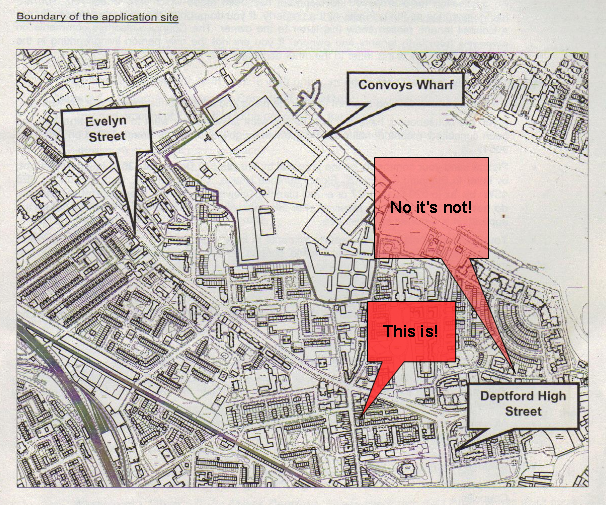 It would have been even more useful if they hadn't moved Deptford High Street over towards Greenwich. 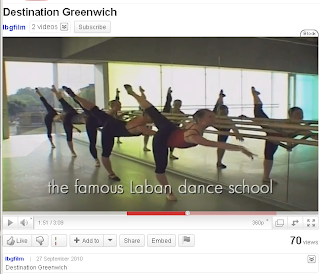 And while confusion reigns, Greenwich Council have made another grab for the Laban, claiming it as being part of what makes Greenwich such a wonderful place in their ''Destination Greenwich'' video. 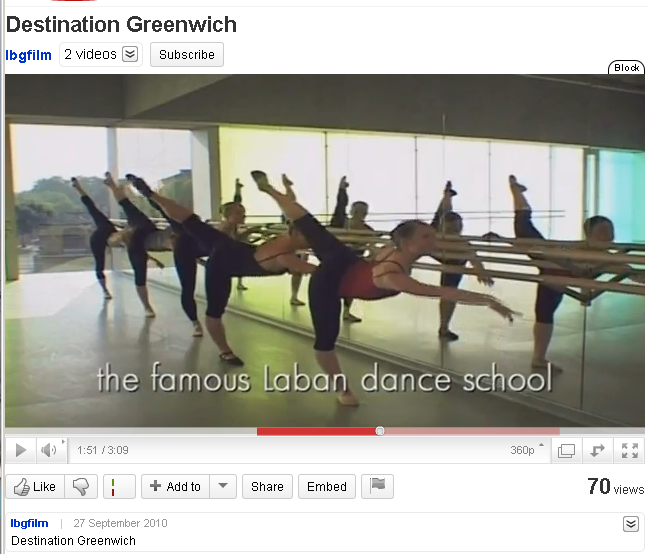 Here's a group of dancers displaying what they think of Greenwich's geographical skills. Erich is immortalised in a Crossfields mural painted in 1982 on the side of Cremer House by Claire Humm (now living in Hastings). That's him, behind the bar, of course. 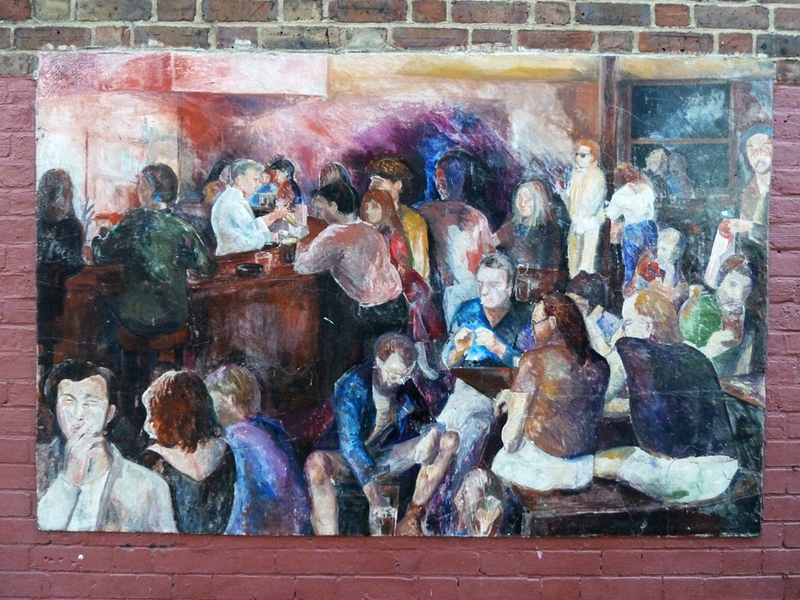 A small number of the pub's pictured clientele still live on the estate, or in the area. Erich recently passed away, and his funeral will be held on Friday 19th November. "It begins with 10am mass at Our Lady of the Assumption Church in Deptford, then on to Charlton cemetery for around 11.30am where he'll rejoin Anna and Aidan, and then on to The Duke from around 12.30 onwards. All are welcome. Flowers are fine or donations to cot death research (fsid.org.uk/), whichever people prefer." *Violinist Bobby Valentino (then of The Bluebirds) recalls a time in the early 1980s...'A variety of guitarists would be there including - intermittently - local heroes Mark Knopfler and Tom McGuinness. The most “musicians” we ever had performing in the corner of this very small pub, was fourteen. The “divvy” of the £30 fee didn’t cover the refreshment expenses...The audience often included other famous locals like Glen Tilbrook (who was later to produce a couple of tracks for the band), Albert Lee, and the above mentioned guitarers. The place became so packed (it just could have been the number of muso's) it was pointless having a break since we couldn’t get to the bar, and the beers had to be passed forward. The South East London Mercury when reviewing an evening likened it to “...sharing a train compartment with the cast of the Muppets” '. (Extract from Bobby's website here). Truly memorable days for some of us, with Erich (and his wife Anna) at the heart of it. Some may be overjoyed, some may be disheartened, but the new Tescos Express we reported on back in March (here), has now opened, as part of the Theatro development on Creek Road. 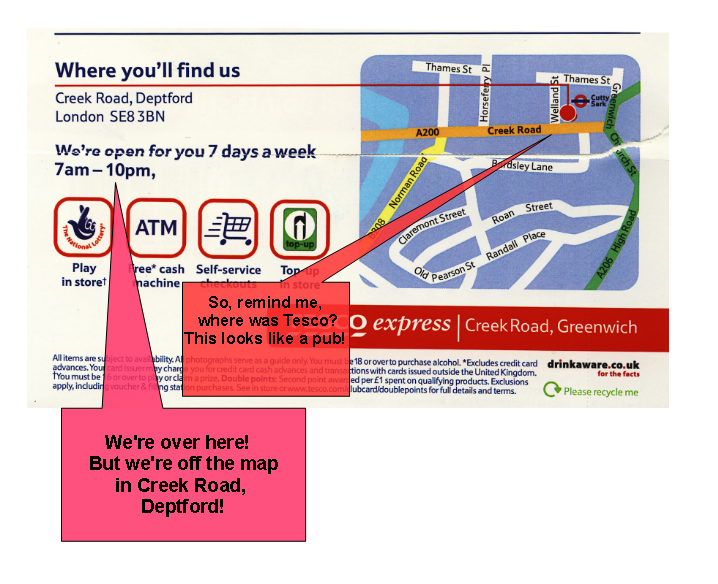 A reader commented back in March: "Tescos: dontcha know they feel lonely unless there are a few within walking distance from each other? Rather like the betting shops in the high street, methinks." If you find yourself using the high street store in the evening for last minute supplies you may be pleased that you'll no longer have to navigate through the drunk gamblers outside Ladbrokes and Paddy Power who represent the main nightlife on the high street now. 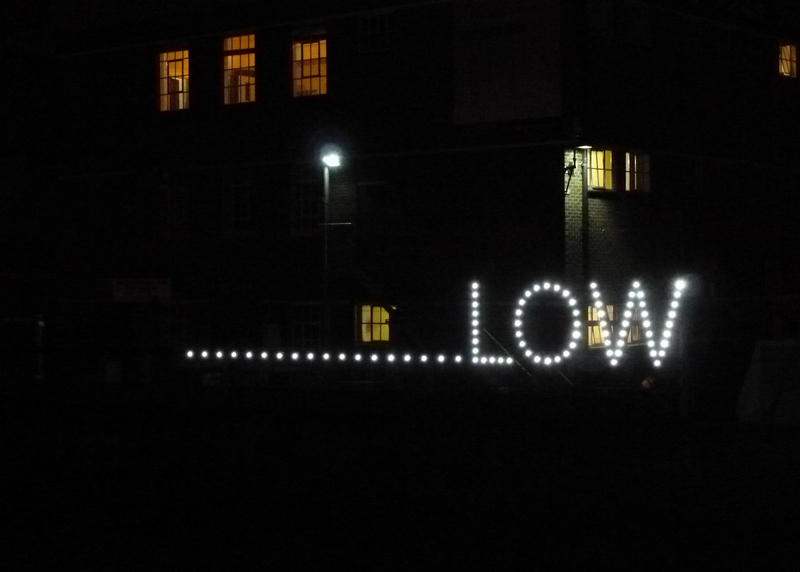 The campaign against Tidemill Academy (academies.sayingno.org) will be projecting their short video "Deptford Says No to Tidemill Academy" onto the side of the new Deptford Lounge in Giffin Street this evening at 6.30pm. They hope to raise community awareness of the school's plans to opt out of local authority control. They say that the new building, which will house the new school (at the back of the development by the railway), has been publicly funded but is in danger of being handed over to a privately run trust for a peppercorn rent. And they say that the trust, run by private sponsors, will lie outside any democratic structure and become unaccountable to the community it should be serving. It will buy from privately owned companies the services now provided by the local education authority. Parents who disagree with any school policies will have to appeal to the Secretary of State, rather than the local authority. Show your support for the campaign by turning out this out this evening to watch it. Meanwhile, if you can't make it at 6.30pm see it here. 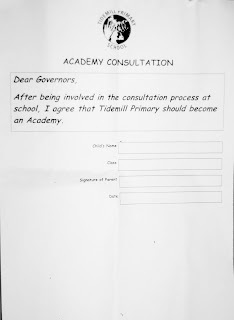 If you want to help stop Tidemill becoming an academy, respond to the consultation document, replying by Email or Post by Monday 15th November. 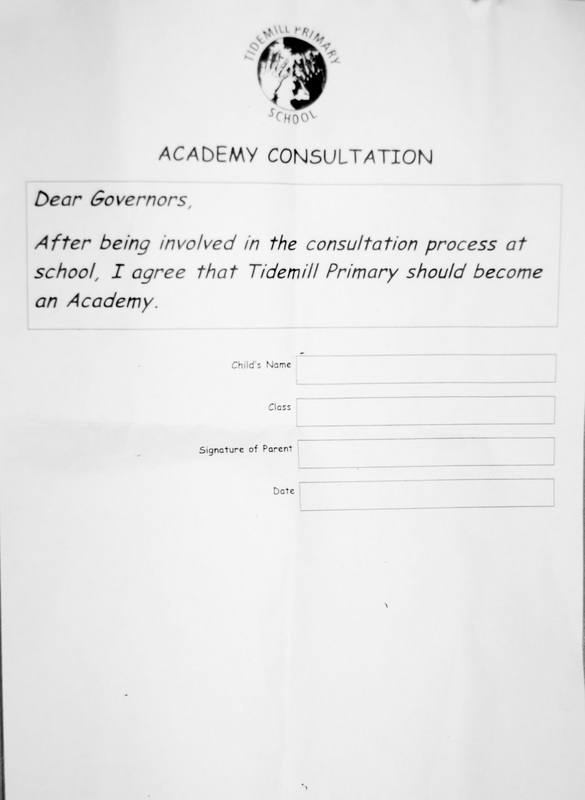 Post: Chair of Governors, Tidemill School, Frankham Street, London, SE8 4RN (make sure to keep a copy). Feel free to extract some points from the campaign's counter argument They Say, We Say, or just register your opposition to academy schools in general. Copy any letters to: jeevan.vasagar@guardian.co.uk, john.hugill@slp.co.uk, CllrPaul.Maslin@lewisham.gov.uk, cllrpaul.bell@lewisham.gov.uk, steve.bullock@lewisham.gov.uk, frankie.sulke@lewisham.gov.uk, letters@guardian.co.uk (and anyone else you think may be interested). 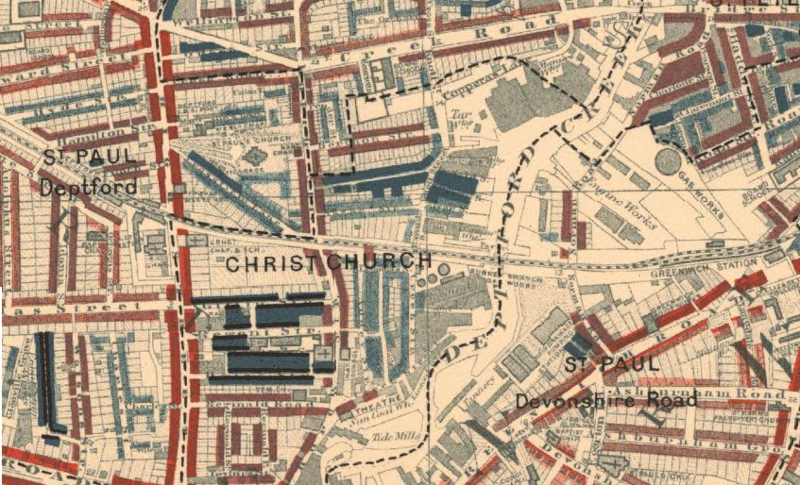 it appears that Regent Street - or Stanhope Street - has been re-named Frankham Street, and Hale Street has disappeared apart from the High Street end where there's the remains of a narrow road behind the Shaftesbury Centre (or whatever that churchy-chapelly thing is called). The next part of Booth's walk takes him from Mechanics Path/Resolution Way. opposite Giffen Street and south of that point, people are poor. Barefoot girl came out of one house. Group of women talking in doorway near Hale Street. Men sitting on pavement outside publichouse with feet stretched across footway. Pony cart standing on road – chalked for sale. Few shops are comfortable. German baker etc. hardly makes the area seem more prosperous. W along Giffen Street. 3 storied, about 6 rooms. Many of the houses at the east end are dilapidated and boarded up. Slatternly women standing about; some shoeless children. Low class, some prostitutes, hawkers, etc. Some houses let in furnished rooms. Street Roadway has been made up – covered with tar paving and shingle. All this sounds very attractive. Low classes, poverty, prostitutes and hawkers. And again, women standing around talking, though this time they're ''slatternly.'' Though there were fewer ''charges'' therefore the area had improved. Linking Giffin Street and Regent Street there appears to have been a connecting street, Bevill Street. S along Bevill Street. 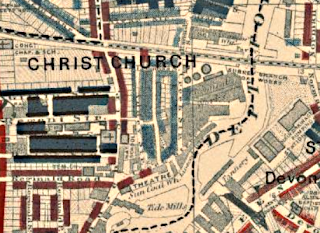 Deptford Ragged school – a large square at W. corner of Giffen Street. Three 3 St houses on east side – like Giffen St. Dark blue. E along Regent Street. Two storied houses – broken windows. Some street sellers. Two women talking in roadway as we entered. ''Well known prostitutes'' said the Inspector. The women moved off quickly, evidently recognising him. Board School extended to W. Dark Blue as map. S and W along Hale Street. Narrow crowded street. 2 st houses. Broken windows, sills broken away. Street doors open into room. Beds seen through ground floor windows. When visiting with Inspector in the morning the women were standing about the doors, criticising their visitors. At an afternoon visit I found them sitting on groups on the foot path, one on a chair, more on the edge of the curbstone whilst one woman completed a small circle by sitting in the road with her feet toward the kerb. Costers driving home on their pony carts. 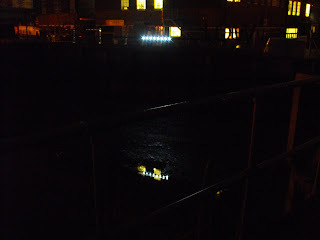 Candle factory at west end of street, emitting very evil smells. Not much crime. Dark Blue rather than Dk B lined as map. N into Stanhope Street. 2 st houses, flush with pavement. Broken windows, cemented roadway blocked with barrows. Two men breaking up some gas fitting and putting the metal in a sack. A few Italians; some costers and prostitutes; shoeless children running about and frowsy women gaping at the doors. 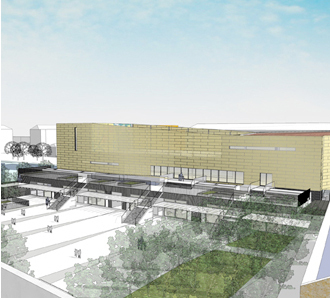 Board School takes greater part of north side. The west end of the north side is more open and the people a little cleaner, approximating to LB. Dark blue lined black as map. It seems odd that the only reference I can find to him returning somewhere for an ''afternoon visit'' happens to be to where there are well-known prostitutes. I wonder why he returned. There are a couple of these two-page posters still hanging up around Deptford. 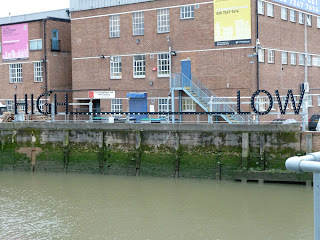 This one is pasted onto the wall by Kim's newsagent in the High Street. Fancy that! How do you learn a train? Is it like reciting a tram? Learning a bus? Disregarding the fact that there is no company or college name and only a mobile phone number, the offer of ALLOWANCE CASH OF £££ 95 WEEKLY for only studying HALF A DAY A WEEK IN 6 MONTHS seems just a little too good to be true. So I phoned the number and asked about these Btec qualifications. No company or college name, just a ''Hello'', and no apparent immediate knowledge of Btec courses until I asked him about the poster I'd seen when he got his brain in gear. But he was too busy (well, it was just after lunchtime) and I'd have to call back. What time? Around 5. I was tempted to call back just to see what kind of a scam it was. But I couldn't be bothered in the end. But some free advice, worth £299 a month to you as an exclusive offer (no obligation): if you want to pretend to be a business, first think up a business name and then don't make it unbelievable by offering the moon. And above all, WANT TO LEARN A TRAIN makes absolutely no sense whatsoever. So learn your trade. Finally good luck with the English lessons. In particular several of our parents with English as an additional language have expressed how they are finding this lobbying confusing and how it is causing them considerable anxiety. ...it declared. So, let's examine how much care the school has taken to accommodate people whose first tongue is not English. Because this would be a good measure of the amount of respect and consideration the school pays towards newcomers. Si - The sudden introduction of a capital letter in the middle of a sentence is even rarer in French than in English. It should be si. comprendre se document - comprendre is fine, so is document. These are the 4th and 5th correct words, se however is wrong, it should be ce. Good luck with the French lessons. I feel that I ought to be writing something incisive about the future of local primary schools but I need to allow myself to stand back and take a few philosophical deep breaths. So meanwhile, here's something that had never struck me before. I went up to the display on Blackheath last night, took a few photos, but it was only when I got back to the quiet of my flat that I realised quite how floral fireworks are. Half a year from spring and in a carnivalesque inversion, the vibrant daytime displays of spring are recreated against bleaker winter skies. Is it just me who sees something vernal? 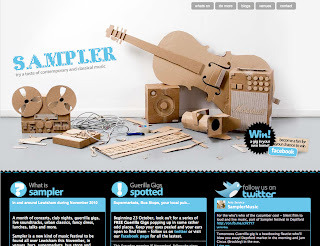 Sampler is "a new kind of music festival" to be found all over Lewisham this November, in venues, bars, supermarkets, bus stops and shopping centres, featuring everything from string quartets to beat boxers. A beatboxing flautist was down in Deptford Market yesterday as part of the free 'Guerilla Gigs' (we missed him)! Live voice, film and electronics create a rich, contemporary sound world from composer Ambrose Field and featuring internationally renowned singer John Potter. Haydn's Symphony No. 43 'Mercury', Alan Rawsthorne's Divertimento and Schumann's Symphony No. 2. in the beautiful setting of St. Paul's Church. An accident occurred on July 17th resulting in a rather huge hole in the wall. The TRA has entertained excuses about 'waiting for the insurance' from Lewisham Homes/Council (same thing) ever since. Actually, when you think about it, almost four months, it's not so long to wait. Greenwich to sell off housing stock? 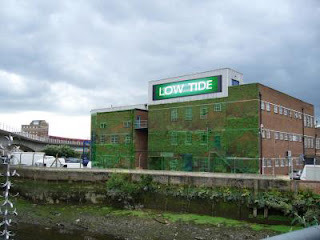 Rumour has it that "Greenwich Council's Labour group have voted through a proposal to transfer all council homes to another owner with a 50% rent increase to 20% below the commercial market value. They have also scrapped right to buy and will issue all tenants with a new lease with no security..."
Can anyone confirm/refute/tell us more? 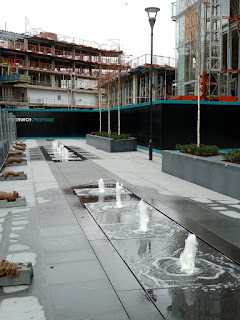 The new development in Giffin Street has cost almost £20m, some £11m of which has come from Lewisham council tax payers, the rest coming from the government (which includes Lewisham taxpayers). The school has been an integral part of the council's plans to rejuvenate community resources in the centre of Deptford and £10m of the overall cost has gone into the construction of the school, £2.5m of which has come from government. If the school becomes an Academy, the new building that has cost Lewisham council tax payers £7.5m, may well be handed over on a 125 year lease to a private trust for a peppercorn rent. 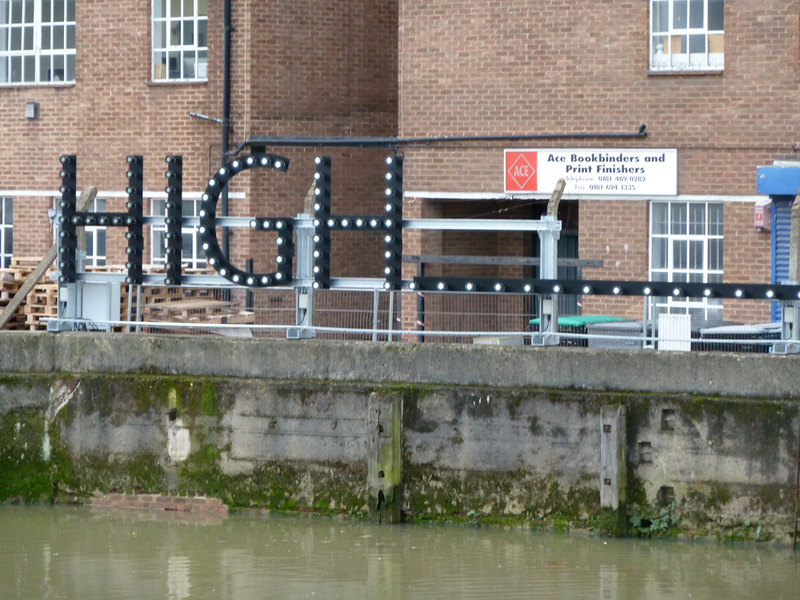 When we first heard a month ago that there was to be consultation with the community on Tidemill becoming an Academy, we went to the school's website to find out more. There was nothing about the school's intentions on the home page, but information was hidden away on a News & Events page. There we found an invitation to download some documents that would explain the pros and cons. But the links did not work. Those links finally started working last week. We read that the Academy Consultation document, which explains how the new Academy would work, would be widely distributed within the local area, including The Albany, Deptford Project and Wavelengths Library. It was not. The document also stated there was an appendix at the end containing questions and answers provided by the government. This appendix did not exist. The document is directed at 'Parent & Carers' with no mention of the community. 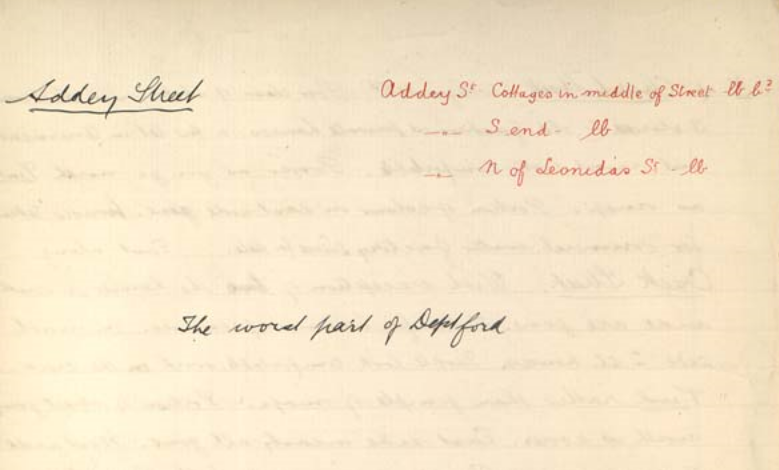 The last page of the document was intended as a feedback page that had to be printed out, filled in by hand, and handed in to the school office. School office hours were not given and the school does not have a postbox. There was no digital version available (eg a Word document that people could fill in and email back) although an email address was provided. However, we are pleased to see the school has finally got its act together and the school website has now been updated. The home page now has a direct link to an Academy Consultation page, and you can download the various documents – the most important being the Parent & Carer Academy Consultation document referred to above (still no mention of the community). 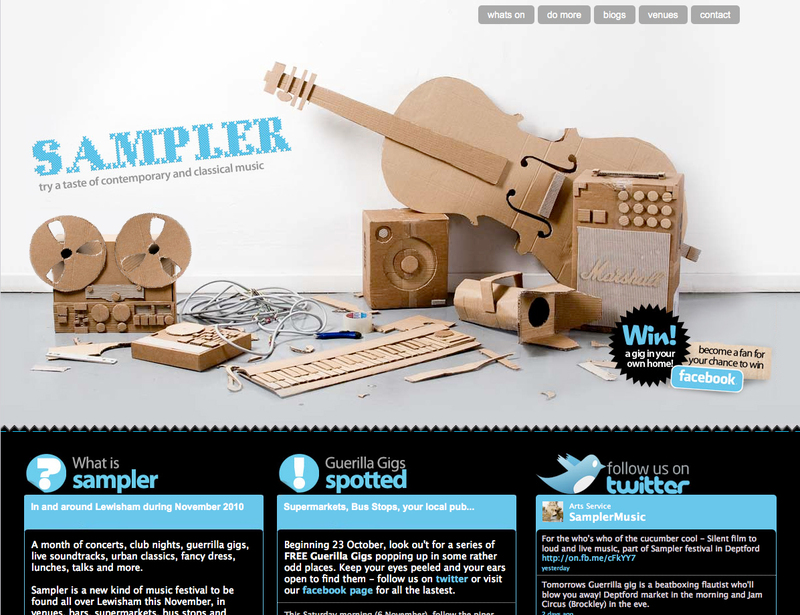 You can then fill in an online form on this page to give your comments and feedback. The deadline is November 15th. There is also the option to download the form and fill it in by hand as before. You may also email, as before, the Chair of Governors to ask any questions you may have that you don't feel are answered in the Consultation document. Meanwhile, the Saying No campaign has provided a short "They Say, We Say" document that expands on the wider implications of some of the Consultation document's claims. This may help inform your opinion or raise queries to put to the school governors (see bottom of this post). It should be noted that none of this consultation would have taken place without the efforts of the Saying No campaign (which is opposed to Academy status). Those campaigners have been threatened by the school with police action and the school has written to parents, reporting the campaign as threatening the safety of the school's children and as holding "aggressive meetings that resulted in verbal abuse", none of which is true. The school's own consultation meeting with its parents was poorly attended. Parents perhaps remain unaware of the true consequences of the choice presented to them. Many parents do not have English as a first language and, if the poor translations provided on the document requesting those parents to contact the school office are anything to go by, they will remain uninformed. No translations of the document are offered on the school's Consultation page. However, Saying No has provided rough translations on their site. Other opposition to the school's Academy status comes from Lewisham Councillors and the architects involved in the new building design. We posted on 23rd October that the next meeting of Crossfields Green Spaces would be on December 8th. We were incorrectly informed. It is in fact this coming Monday. Claire Pritchard from Greenwich Co-operative Development Group will be there to talk through how to get the group set up properly. 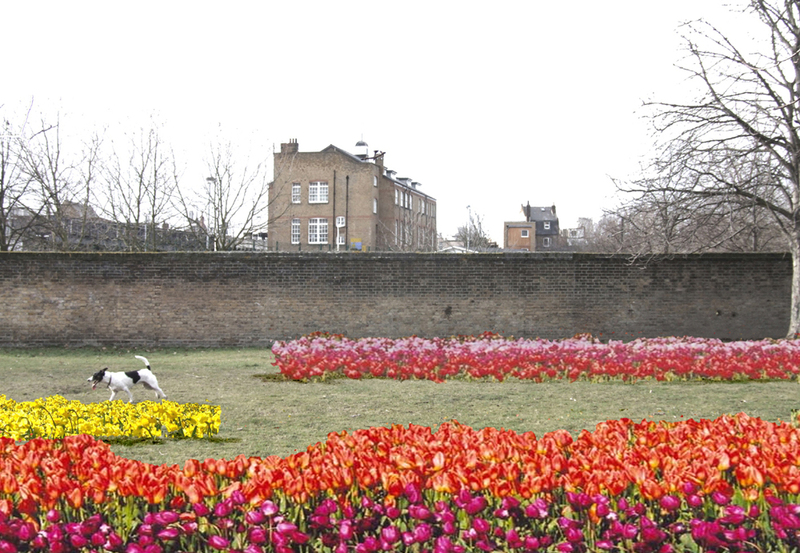 Also attending will be a Lewisham Homes rep who will be helping with the implementation of the Window Box Project – the result of a successful grant bid to help us make the most of our window boxes. 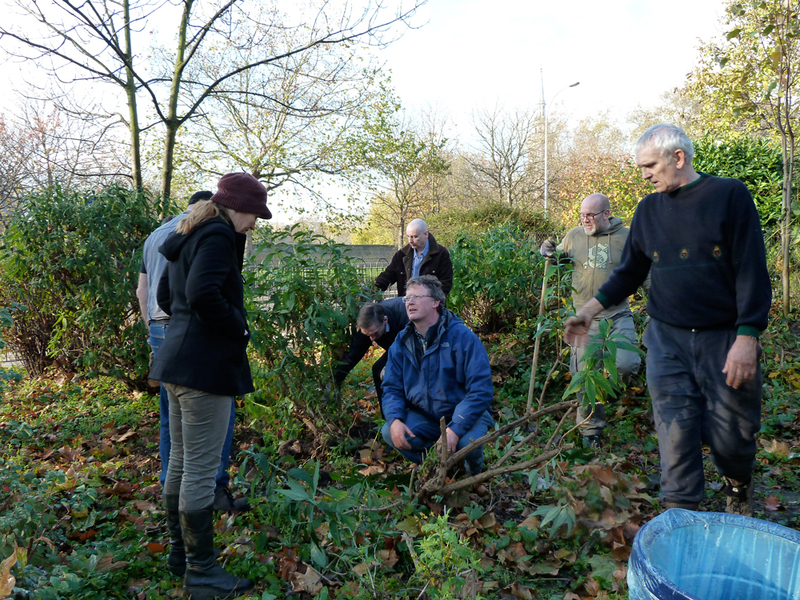 There is also a call for volunteers to help in the clearing and regenerating of the Sue Godfrey Memorial Garden that is happening on December 15th. All green fingered residents are welcome! For more information go to crossfieldsgreenspaces.wordpress.com. Looks like the relentless rise of Paddy Power's gambling empire has now ensnarled the John Evelyn. The late John Evelyn. 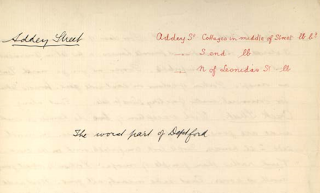 That was a bit naughty of me yesterday - though I put in a link to the map, I didn't put in a link to the notebook from which I had transcribed a couple of extracts. So let's put that right. 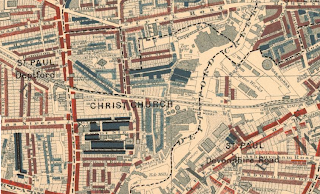 The next stage in Charles Booth's journey brings him closer to Crossfields Estate but might be a little confusing because he goes walking up streets that no longer exist. Here's a map to give you some bearings - the online quality is not great but you can make out Addey Street (which Booth occasionally calls Addis Street) running parallel to Church Street with a further unnamed street running to the east. 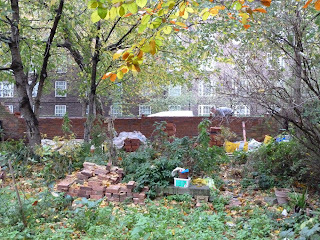 Much of Addey Street appears to have been retained as the estate road running from behind Wilshaw House north to the railway. The unnamed street was Hosier Street and where the entrance to the north side of Holden house now stands, there was Leonidas Street. N up Church Street (to Reginald Rd). Poor class of shops near the Broadway, 3 storied and old fashioned private houses, a few let in tenements but most look comfortable. Poorer as you go north. Pink as map. Portion of colour on east side gone – houses taken for mineral water factory. Lease for sale. 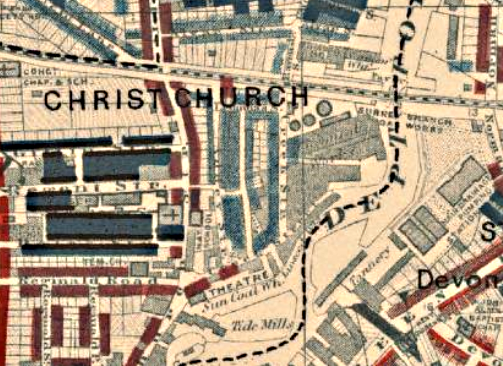 Though the south end of the Broadway has been rebuilt, there are once again a handful of very small shops at the Broadway end, and the mineral water factory must have been situated more or less where the car parking area behind Lewisham College now lies. I do hope that they didn't get their water from the nearby Creek. East along Creek Street. With exception of two, the houses on south side are gone. Taken for business premises. On north side 2 st. houses. People look comfortable, work on the creek. Pink rather than purple of maps. Portion of street going north is poorer. East side nearly all gone. West side 2 storied houses. Purple (as map) to LB. Prefer latter. By the S side of railway is a passage eastward leading to the railway bridge across the Creek. Known as the ''Halfpenny Hatch.'' Toll of 1d charged for crossing. Inflation clearly is not a recent phenomenon - already it costs twice as much as its name suggests. W into Leonidas Street. 2 st. 4 rooms, flush with pavement. Paint good, clean and well kept. Decent people mostly one family in a house. Purple rather than LB of map. Colour omitted on south side, Light Blue. S down Hosier Street. 3 rm'd cottages, poor labouring class. Some broken windows. Part of SE end of street taken for factory. LB as map. Colour to come off west side south of entry into Addis Street. Ground plan of street wrong at south end. Street runs into Creek Street near Addis Street. Several houses between Hosier Street and turn in Creek Street. The recurrent references to colour reflect the colour coding Booth used to show levels of affluence. Leonidas Street is roughly where the estate entrance opposite the Creekside Centre is. Hosier Street has left no trace of itself though. 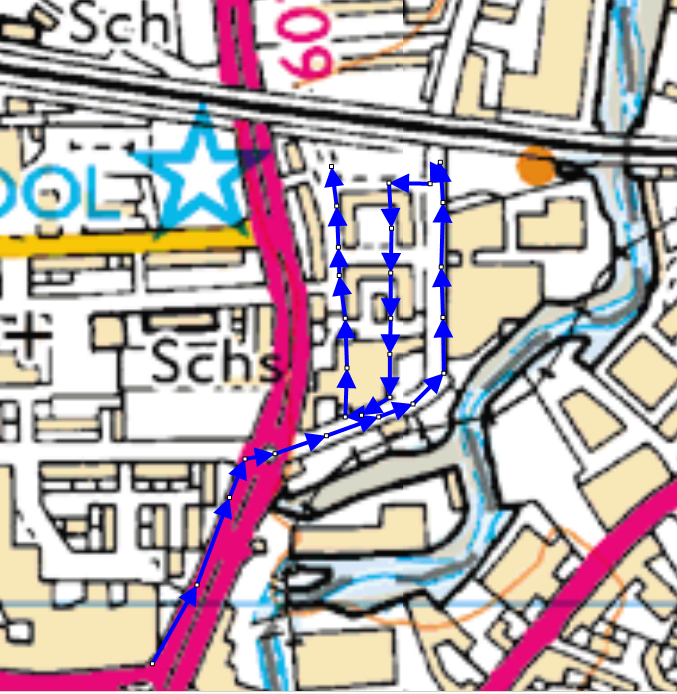 Its old route would take you through Holden and Wilshaw and and back out onto Creekside. N along Addey Street. Small 2 St houses like Hosier St. south of the passage into Hosier Street. LB in character. Between the entry into Hosier Street and Leonidas Street is a row of old houses on E. side. 4 rooms and attic in roof. Footway leading to houses is about 2 ft below level of roadway and is protected by iron railing. Some prostitutes and criminals. 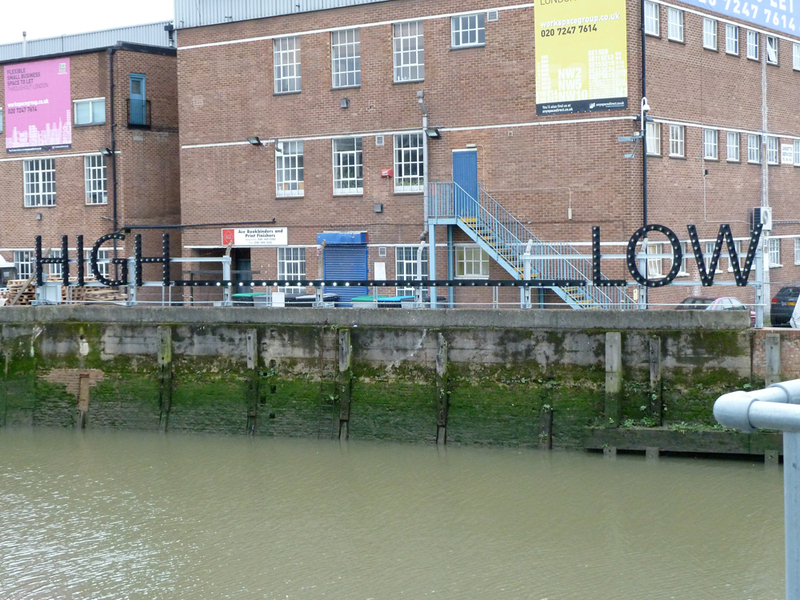 Low rough class: reckons this the worst part of Deptford. Went into a house here to arrest a man at 5am. Found father, mother and 5 children in one room. All rooms are small. This piece should be D.Blue lined. Houses opposite are 2 st. D.Blue in character. 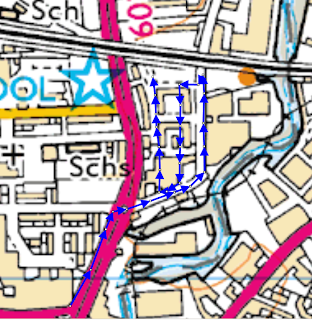 Northern part is 2st and Light Blue except 3 shops and publichouse north of Leonidas Street. 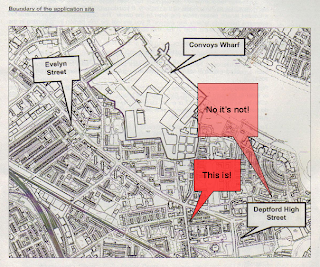 As they walk back north up Addey Street the inspector remarks that he ''reckons this the worst part of Deptford.'' which Booth marks out here. So, prostitutes, 7-to-a-room overcrowding and criminals - the low rough class. I think we may have become slightly more gentrified since Booth's day.